Bernie Pernot, an engineering manager and process engineer for Carestream Health, says it's a "win-win" when his company collaborates with students at the University of Rochester's Hajim School. "Students get involved in a manufacturing site and a project's life cycle," Pernot says. "Our company benefits by helping to support students and getting project results." Those results included crossover data that optics students Sarah Walters and Anthony Yee prepared for the company as part of their senior design project for the 2012-2013 school year. The data will help the company upgrade a piece of equipment used to characterize the phosphors that Carestream, a worldwide provider of dental and medical imaging systems and healthcare IT solutions, uses in computed radiography. The Hajim School of Engineering and Applied Sciences welcomes such collaborations with outside companies. Jim Zavislan, the incoming associate dean for the Hajim School and the Institute of Optics senior design instructor, says, "The undergraduate engineering curriculum provides students with foundational understanding as well as theoretical and practical tools. Applying this understanding and their tools to the needs of customers teaches the students how to effectively use their education." Biomedical Engineering: Assoc. Prof. Amy Lerner, amy.lerner@rochester.edu, (585) 275-7847, 307 Goergen Hall, or Assoc. Prof. Scott Seidman, Scott_Seidman@urmc.rochester.edu, (585) 273-2122, Box 603, 601 Elmwood Ave., Rochester, NY 14642. Chemical Engineering: Assoc. Prof. F. Douglas Kelley, doug.kelley@rochester.edu, (585) 275-7696 or (585) 613-1944, 201C Gavett Hall; also Senior Technical Associate Rachel Monfredo, rachel.monfredo@rochester.edu, (585) 275-7885, 109C Gavett Hall. Electrical and Computer Engineering: Adjunct Prof. Victor V. Derefinko, derefink@ece.rochester.edu, (585) 275-9402, 305 Hopeman Hall. Mechanical Engineering: Asst. Prof. Douglas H. Kelley, d.h.kelley@rochester.edu, (585) 275-7769, 218 Hopeman Hall. The Institute of Optics: Assoc. Prof. Jim Zavislan (Assoc. Dean of the Hajim School), zavislan@optics.rochester.edu, (585) 275-9819, 416 Goergen Hall. 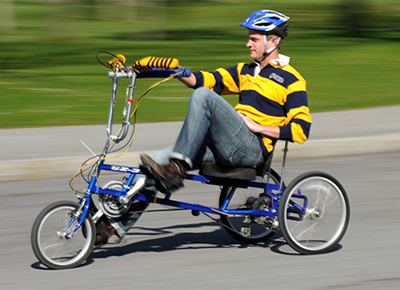 A control device that allows users with only one functioning arm to operate a recumbent tricycle, which received the international Student of da Vinci Award sponsored by the National Multiple Sclerosis Society. A system to test a serial filtration method using silicon nanofilters, technology used by the UR spinoff company, SiMPore, Inc.
A refreshable braille display that acts as a computer screen for the blind team, which won honorable mention at the 2013 Intel Cornell Cup competition. A respiration monitor for use on very low birth weight newborns, which received a $50,000 grant from the UR Technology Development fund to develop a second-generation prototype for introduction into the Neonatal Intensive Care Unit. Other companies collaborating with students have included OptiPro Systems, a global leader in designing and building computer controlled grinding, polishing, and measuring equipment for the precision optics industry. Jakob Maag-Tanchak, a 2012 Hajim School graduate now working as a mechanical engineer for the company, volunteered to help out when four students used a system available at the University to run a set of computer simulations to model some fairly large scale tooling beyond what the company uses now. "Their results were excellent –they gave us conclusive results that will help with developing larger tooling. We couldn't have done much of the work that they did," Maag-Tanchak said. "One of the tools that they were working with was fabricated in the meantime and the feedback has been very positive from our operators." "Given the opportunity, we would participate in the senior design class again."